This Is My Faster! : What's your Boston? Although a lot of long distance runners strive to run the Boston marathon at some point (or several points) throughout their running career, not everyone has that goal. Or rather, Boston isn't necessarily THE marathon event for them. However, there is usually an event that is akin to the Boston marathon for most runners. An event that has some significant meaning. A "dream marathon" per se that one aims to accomplish/participate in. The event that holds the #1 spot on our "running bucket list". For me that event is the Athens Marathon. Athens is my "Boston" because it is the original marathon course. The historic significance of running the course that began it all simply cannot be downplayed (I know that the Boston Marathon has historic significance in the US, but Athens is international...you just can't top that). In 2013, when I started running, my goal was to train for the 2014 Athens Marathon. Then I researched the airline ticket prices to Greece. My goal date quickly changed to 2015...and then to 2016 (I need a lot of time to save because you can't go half-way across the world to run 26.2 miles and then come back home without first taking a trip to the Greek Isles right?). 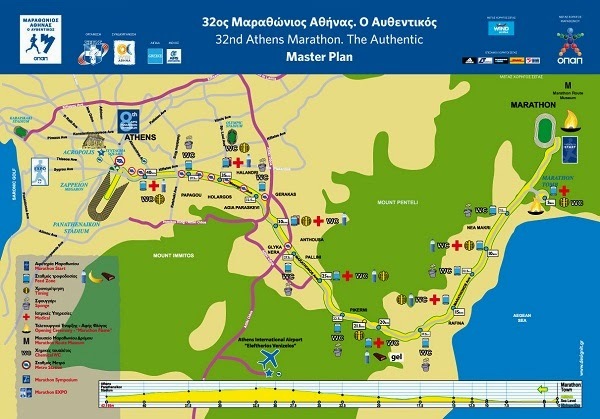 The Athens Marathon is not only steep in historical significance, the course itself has an incline that should not be taken lightly. I am going to have to channel my inner Pheidippides when I start attempting that hill (which, as luck would have it, is towards the latter part of the course). I wonder if Pheidippides utilized a run:walk ratio? What Pheidippides wouldn't have given for some Gatorade or Gu! Due to the above mentioned airline ticket cost dilemma (and other extenuating circumstances) my Athens Marathon "bucket list completion date" is currently set for November 2016 (I refuse to push it back any further.....but you know how I feel about Murphy's Law right?). By the time 2016 rolls around Athens (if all goes according to plan) won't be my first full marathon either. I plan to complete the Chicago Marathon in October 2015 (as my first full). There is great significance in my doing my first half and first full marathons in Chicago. Chicago is where I was born, so for me it seemed fitting that my half & full marathon debut should be in the city of my birth. After all, you saw the view of the lakefront trail...who wouldn't want to run there?! One day I will add Boston to my bucket list. I probably won't get in based on time....sigh, but if they have the lottery or charity fundraising option that Chicago does, it's possible that you might see me run:walking to the finish line in Boston one day....after Athens of course. What is the one thing/gear/device/advice that you can't run without?